Following on from our blog post earlier in the week announcing Office 365 Pro Plus Benefit for Teachers, we’d like to share the following post by Alex Pearce from BFC Networks, a trusted Microsoft partner. 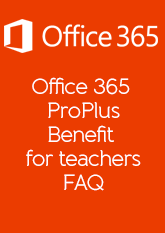 Below he has answered some of the more common questions that he is asked about Office 365 Pro Plus Benefit for Teachers and Students. Some time ago Student Advantage was released where schools could request from the Microsoft Licensing Reseller licenses for their students and get Office 365 Pro Plus as part of their current license agreement. Now renamed to Office 365 ProPlus Benefit for Students, teachers and faculty staff can also request a licenses but how do we get these added to the tenant? It’s a matter of requesting the licenses from your Microsoft Licenser Reseller in the same way as you did for Student Advantage. So get on the phone, get your email off and request your licenses. Q. Is this one or two licenses? A. These are two licenses, one for students and another for teachers. Assign the right licenses to right stake holder. Q. What should I get from my licensing reseller? Q. We only pay Microsoft Licenses for Full Time (FTE) staff. Can I request more to cover all faculty and teachers? A. Yes you can, all you need to do is request the number of licenses you want from your reseller. Q. What do I do when I have received the licenses and added them to my Office 365 Tenant? Q. What is included in the license? Q. Do you have anything that would help me promote this around the school? A. Take a look at the promotional material from the Microsoft UK Education team on their slideshare.